Christmas has come and gone. It is easy to get carried away with all the Carols, extended family gatherings, visitors, Summer weather and the beach, holidays, etc. and forget that the true meaning of Christmas is this is when God chose to send His Son to earth. Now that is gone, it is time to make a fresh start on a new year. I love a new year. The old is gone along with any heartaches, mistakes and disappointments if there are any and the new is full of promise and hope. Without hope we have nothing worth striving for. I have a firm belief that God has the course of my life in his hands. This gives me the confidence to go forth in this world, to make plans, to reach out in love and to try to encourage others to have the same hope. On a personal level there is one thing I want to strive to be with God's help, that will impact all around me. I also want to expand my online shop to include other product lines. 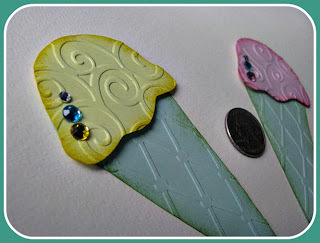 The first of these being the introduction of Scrapbooking Embellishments also known as Card Candy. 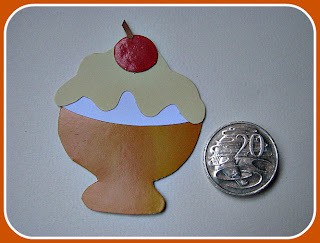 These embellishments could also be used in card making, tag art, bookmarks, aceo's, gift bags, altered projects and various other crafts, in addition to various themed scrapbook pages on holidays/spring/summer/picnic etc... . Some have textures embossed in the card, others the tint of colored edges adding dimensions, some may be accessorized with bling, lace or other media. Mmost are hand cut and thus are one of a kind. Any one of these are just perfect for your projects. I also love Mondays and greeting the dawn of each new day. They are all symbolic of the opportunity of a fresh new start.So lets go forth and see what this week and this new year has to offer. 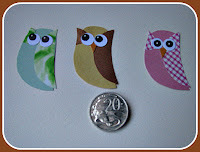 If you love to look at more of my Scrapbooking Embellishments, then go here to my Zibbet Shop Inkspirational Designs. I love to custom make and designs for you too, so just send me an email and we'll see what I can do for you. Wow! I just love your new Scrapbooking Embellishment line. I think you will go a long way with these. 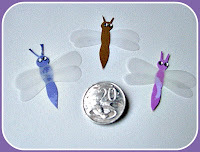 I have placed my order with your Zibbet shop. I am looking forward to adding them to my scrapbooks. 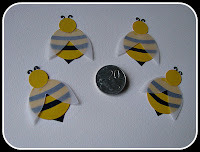 Ever thought of re-purposing card too! We all got to 'do our bit'. Garlands and Banners for Valentine.